Every year come April, we get so excited to read and promote poetry for four solid weeks as we celebrate National Poetry Month! We love getting to chat with poets, we love organizing our own events and seeing what comes into our calendar, and most of all we love seeing how all of you take part in the celebrations. If you want to do something special for National Poetry Month this year but you aren’t sure where to start, check out our suggestions for some popular ways to get invovled! You can find all of our official 2017 NPM17 materials, time-themed, here. While the League does prepare content to celebrate poetry, we’re always looking to see what else is going on! Using our hashtags and tagging us are the best way to share your NPM celebrations with us as well as with anyone else following the hashtags! We are @CanadianPoets on Twitter, and we’ll be following the hashtag #NPM18 this year. Invite between one and five local poets to share 5-15 minutes’ worth of their own poetry. Possible venues are a bookstore, a bar, a coffee shop, or a library. Sometimes open mic nights also feature one or two pre-booked readers who will read for slightly longer than the open mic readers, but not always! This could be strictly poetry, or could be a space for fiction writers, musicians, comics, and other intergenre artists to come and share their work. Open mic spots are usually about 3 minutes long: enough time for a song, a long poem, or a few shorter poems. Open mic nights usually last about an hour to an hour and a half, with breaks. Invite a poet (or a few) to discuss a new project of theirs! This is also a great way to talk about the creative process, and to hear how a popular poet may weigh in on the latest literary goings-on in Canada. Be sure to leave room for a Q&A session! Great venues for interview events are libraries, bookstores, and coffee shops. Spring is always chock full of book launches happening from coast to coast. You may be able to host a book launch for a local poet, or even organize a multi-book launch for several poets. If you are interested in organizing a book launch, consider contacting publishers ahead of time to see if they may be able to help you coordinate with the author! Our 2017 theme is time, and we encourage you to get creative with how you incorporate it! You can find our official 2017 visual materials here. If you run a regular literary event, we hope you’ll consider making your April event poetry-themed and maybe even time-themed. Poets could read work they composed when they were younger, or could read first drafts of now-published work; you could pair established and emerging poets to read their own or each others’ work and discuss how they inspire or influence each other; consider honouring Canada’s history and inviting Indigenous poets to read at your event. Canada also celebrates its 150th birthday this year! We look forward to seeing the creative ways event organizers incorporate time and this milestone into their events this National Poetry Month. National Poetry Writing Month is a popular riff on NaNoWriMo (November’s National Novel Writing Month), although they are not officially associated with each other. Well, NaPoWriMo isn’t official at all, but it unofficially challenges writers to compose a poem a day throughout April to celebrate NPM. You can also sometimes find this challenge called 30 Days of Poetry. Many writers fall into the challenge free-form, writing about anything and everything, but others find or create guides to get them through the month: on April 1, write a poem about your childhood; on April 2, write a poem about…. Usually discoverable on social media under the hashtag #todayspoem, this initiative encourages users to share a poem—original or not—every day throughout April. You can find some readers and writers using the hashtag year-round, but its popularity surges in NPM and it’s a great way to discover new poets and performers through social media. 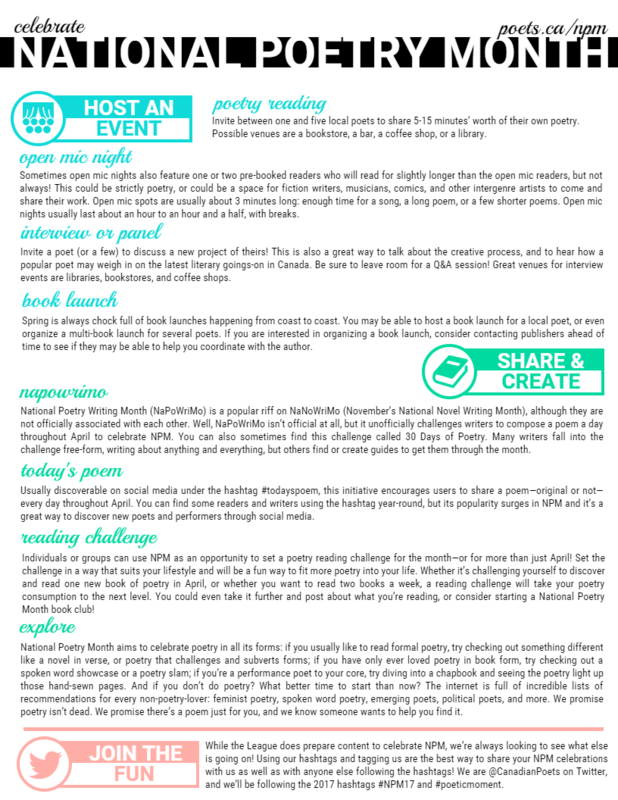 Individuals or groups can use NPM as an opportunity to set a poetry reading challenge for the month—or for more than just April! 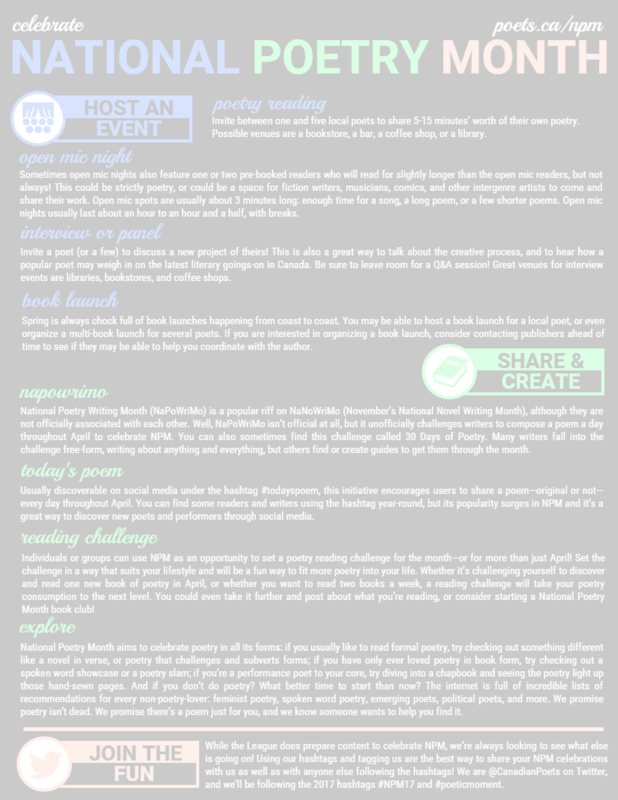 Set the challenge in a way that suits your lifestyle and will be a fun way to fit more poetry into your life. Whether it’s challenging yourself to discover and read one new book of poetry in April, or whether you want to read two books a week, a reading challenge will take your poetry consumption to the next level. You could even take it further and post about what you’re reading, or consider starting a National Poetry Month book club! National Poetry Month aims to celebrate poetry in all its forms: if you usually like to read formal poetry, try checking out something different like a novel in verse, or poetry that challenges and subverts forms; if you have only ever loved poetry in book form, try checking out a spoken word showcase or a poetry slam; if you’re a performance poet to your core, try diving into a chapbook and seeing the poetry light up those hand-sewn pages. And if you don’t do poetry? What better time to start than now? The internet is full of incredible lists of recommendations for every non-poetry-lover: feminist poetry, spoken word poetry, emerging poets, political poets, and more. We promise poetry isn’t dead. We promise there’s a poem just for you, and we know someone wants to help you find it.